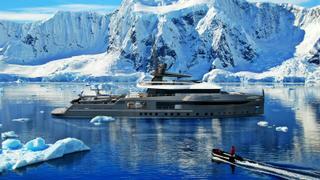 French shipyard Ocea has collaborated with designer Fulvio De Simoni to develop a 50 metre motor yacht equipped to take on the most extreme conditions on earth. Inspired by the harsh landscapes of the Arctic and Antarctica, the Nemo 50 Ice will be built to comply with the requirements of Ice Class rules. The head of Ocea’s Mediterranean office Aldo Manna will work alongside De Simoni on the project, which will draw on Ocea’s heritage of producing military ships. 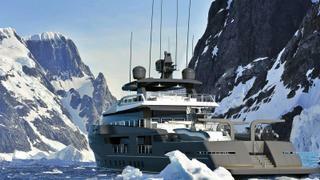 Ocea said the yacht was “conceived to brave the seas at high altitudes while searching for unique landscapes or lifetime adventures”. The shipyard pointed to locations such as the Drake Channel and Antarctica's Cuverville Island and Danco Island as perfect locations to explore in the Ocea Nemo 50 Ice. The yacht, which has a gross tonneage of 499 GT, is equipped to carry tenders, rigid hulled inflatable boats and landing crafts.It will also be equipped with dedicated handling equipment such as specialised military style davits to retrieve them. The tenders will be stored forward on the raised deck, which is also intended to store hiking equipment. This area will also serve as an al-fresco relaxation area providing shelter from bad weather. Another standout feature are the shafts which are integrated into dedicated structural skegs. This will protect them, along with the propellers and two rudders, should a collision with an iceberg take place. The engine room is described as “spacious” and is accompanied by a six square metre workshop and control room fitted with all the necessary remote control systems. The guest’s accommodation meanwhile has been designed for long stays on board while the owner’s apartment is a full width design covering the fore portion of the main deck. It houses a private lounge and has a sizeable bathroom which could incorporate a large sauna if needed. The living areas have also been described as “spacious” and have been designed to maximise comfort during long stays.